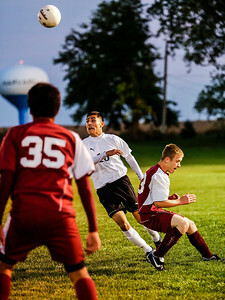 Lathan Goumas - lgoumas@shawmedia.com Harvard captain Angel Sanchez watches the ball in the air during the first half of a game against Marengo in Harvard, Ill. on Monday, Oct. 7, 2013. Harvard defeated Marengo 3-1. Lathan Goumas - lgoumas@shawmedia.com Marengo captain Miguel Cortez dribbles the ball during the first half of a game against Harvard in Harvard, Ill. on Monday, Oct. 7, 2013. 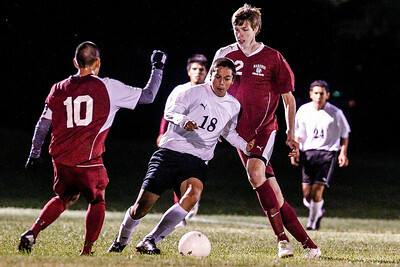 Harvard defeated Marengo 3-1. Lathan Goumas - lgoumas@shawmedia.com Jerry Martinez of Harvard dribbles the ball as Miguel Cortez and Nick Vanvorhees of Marengo try to defend during the first half of a game in Harvard, Ill. on Monday, Oct. 7, 2013. 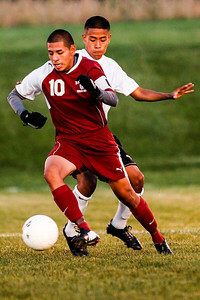 Harvard defeated Marengo 3-1. Lathan Goumas - lgoumas@shawmedia.com Pedro Guzman of Harvard and Jessie Ramirez of Harvard chase after the ball during the second half of a game in Harvard, Ill. on Monday, Oct. 7, 2013. Harvard defeated Marengo 3-1. Lathan Goumas - lgoumas@shawmedia.com Angel Sanchez of Harvard and Jason Wonneberger of Marengo fight for control of the ball during the second half of a game in Harvard, Ill. on Monday, Oct. 7, 2013. Harvard defeated Marengo 3-1. 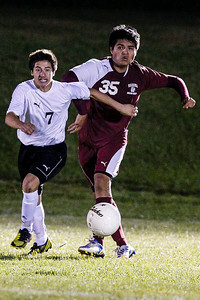 Angel Sanchez of Harvard and Jason Wonneberger of Marengo fight for control of the ball during the second half of a game in Harvard, Ill. on Monday, Oct. 7, 2013. 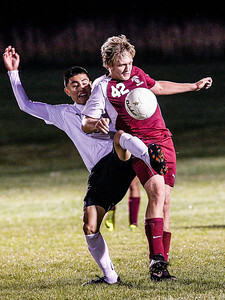 Harvard defeated Marengo 3-1.